Delivers more responses, insights and instant quantitative data at a lower cost than traditional focus groups. Provides qualitative and quantitative input in real-time as clients watch and listen to the Voices of Customer. 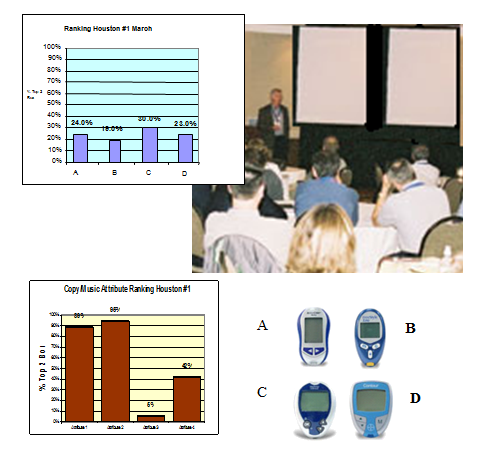 Wireless response meters instantly collect, tabulate and display participant reactions to various stimuli. Each session is comprised of a customized quantitative assessment followed by a qualitative discussion. Combines the depth of focus groups and the breadth of quantitative methods for more efficient insight gathering. Increased amounts of customer data at a lower cost per participant. Easily adapted to Co-development or Brainstorming formats to meet client needs.